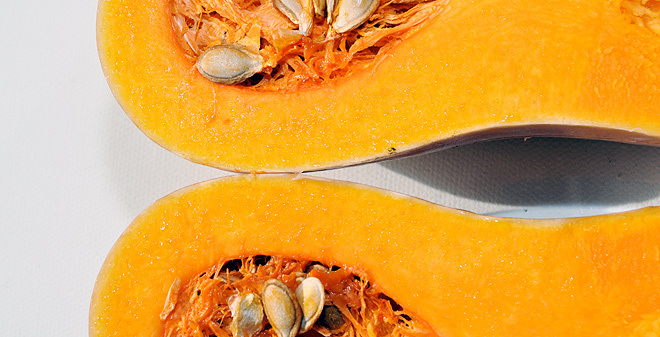 Butternut squash is a fantastic vegetable to use, it's tasty, it's filling and has great colour. 2. Halve the squash lengthways, scoop out seeds. Put into a roasting tin half full of water. Cover with foil and bake for c. 40mins until tender. 3. Drain and transfer the squash to a board until cool enough to handle. Scrape the flesh into bowl. Mix flesh, paprika, chives and creme fraiche together and season. 4. Pop mixture back into Squash shells. 5. Mix butter, parmesan and breadcrumbs together and sprinkle on top. 6. Bake for 15 mins until lightly browned.